NOTE: The images accompanying this review are taken from various online sources and do not necessarily represent the quality of the Blu-ray under review. The David O. Selznick-produced film Topaze is not only the second film adaptation of Marcel Pagnol's world-famous 1928 play of the same title, it is the second film adaptation to be released in 1933 -- roughly a month after a French adaptation first hit cinema screens. Pagnol clearly must have been dissatisfied with that one, because he directed his own film of it -- twice: once in 1936 (just three years after the first French version) and again in 1951. All told, there are about a dozen Topaze films and TV films floating out in the world. Even without doing too much research, one can conclude that this version is probably a less-than-faithful gloss on its source material. The film, scripted by The Front Page's Ben Hecht and directed by Harry d'Abbadie d'Arrast, is consistently amusing but far too lightweight to suggest the kind of story that one would decide to retell again and again. 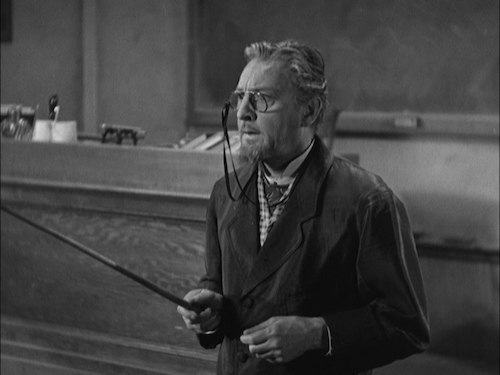 John Barrymore dazzles as the title character, a bookish teacher whose intelligence and goodheartedness naturally makes him an ill fit for a corrupt world. Barrymore is given a long classroom scene in the early going to truly unfurl his character, who is awkward and square, but who is so self-possessed that he demands attention from both his class of reluctant young boys and the film audience. Barrymore resists any inclination to ham it up, or to make Topaze a broadly sketched nerd; instead, his version is idiosyncratic -- peculiar -- and a sight to behold. The plot kicks in when Topaze dares to dole out failing grades to the slacker son of a baron, and he is quickly fired for his bad judgment. But it turns out the Baron (Reginald Mason) is not quite done with him yet. The Baron is set on bottling low-grade tap water and selling it for top dollar (Dasani, in other words). He corrals Topaze into putting his name on the swill, while letting the fuddy duddy scientist think his expertise is required. 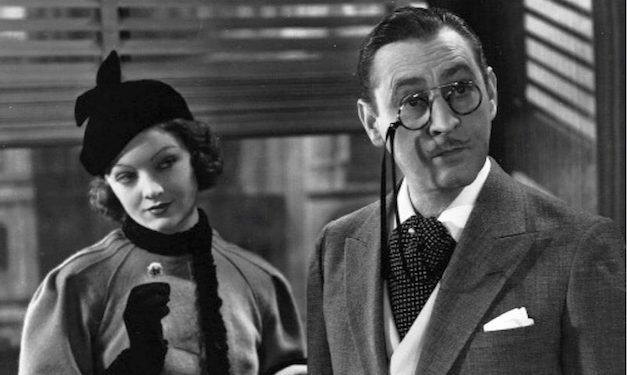 With the help of the Baron's mistress Coco (Myrna Loy), Topaze actually manages to concoct a clean, healthy, refreshing beverage in the lab, but the Baron doesn't bother to bottle that stuff. When Topaze realizes he's essentially become a paid shill for snake oil, he is initially horrified. After it sinks in, though, Topaze decides to outsnake his new boss. Topaze commits two major but not quite mortal sins. The first is that it casts the wonderful Myrna Loy in the leading female role, but then doesn't give her enough of a showcase. Her affair with the baron and her eventual relationship with Topaze are both given short shrift, removing a potential layer of emotional punch and reducing the chances for Loy to flex her charisma (although she does more than okay with the screen time she's got). The second sin is that the film dwells too much on Topaze's guilt after realizing what is being done in his name, while not allowing us enough cathartic revenge to savor afterward. One suspects this might be one of the story areas that was intentionally reduced from the play during adaptation, especially considering Peter Sellers's later 1961 film version was known in the US as, I Like Money. Even with these grumbles, Topaze is an easy film to like. I didn't find myself laughing very often, but I probably smiled at the screen from start to finish. Although the film materials utilized here show scattered moments of light damage, this AVC-encoded 1080p 1.33:1 transfer is extremely satisfying. Strong detail and clarity, considering the age of the film. Good contrast and well-resolved film grain. A fairly high encoding bit-rate is utilized as well. A somewhat limited but still quite satisfying DTS-HD MA 2.0 mono audio track. I was particularly struck by the opening music by Max Steiner. It seemed suitably full and well-delineated. Dialogue is clean and clear, but no subtitles for viewers who are deaf or hard of hearing (or, like me, sometimes just like to read along). Audio commentary by Kat Ellinger - Diabolique Magazine editor-in-chief Ellinger (who recently appeared on Arrow's Images commentary, among others) offers an engaging reading of the film, discussing its frothy cleverness, its Pre-Code edginess, and some of the film's production backstory. Trailers - none for this flick, but some other Kino releases of David O. Selznick productions: The Young in Heart, Intermezzo, Since You Went Away, and I'll Be Seeing You. John Barrymore delivers a strikingly offbeat performance in this likable but lightweight satire of greed and corruption. More Myrna Loy certainly would have been welcome too. Topaze is not a forgotten masterpiece, but I bet you'll have a good time. Recommended.